This Project describes an AVR chip and software that converts two easily formed R/C pulse signals and converts them into a PWM signal suit for driving small motors. This will be good solution for common problem for hobby robotics when controlling the drive level to a motor. As many hacked R/C servo's are used have poor control range. And many micro-controllers don't have built in PWM or the PWM is very slow and makes for lots of motor buzz. 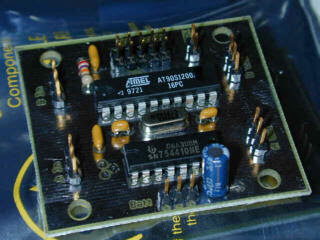 The value of this AVR software application is that one can interface the output signals of the AVR chip to a wide variety of H-Bridge driver chips with a current capacity from 600ma to 5+ amps. Or, it could drive a discrete FET bridge for even higher capacities. The software runs on an Atmel AT90S1200 chip with a 16mhz clock. The project designe by Larry Barello.